Bizarre cults. Anticommunist paranoia. Facebook stalking. 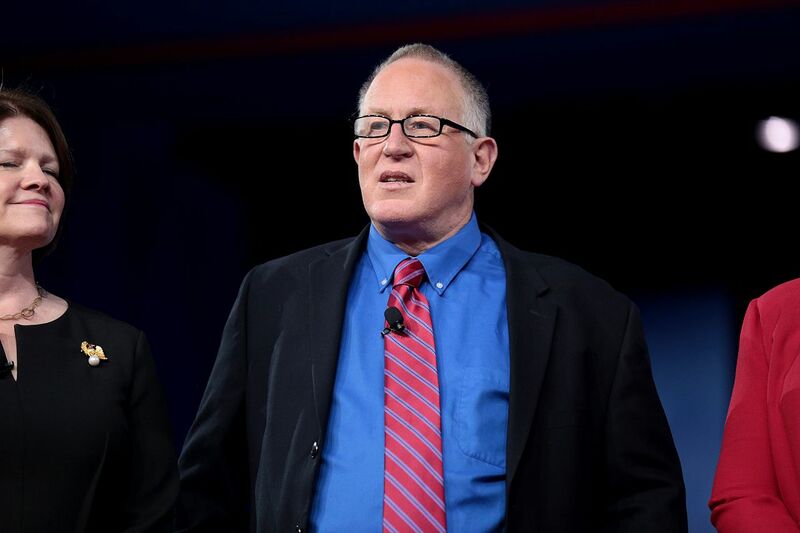 Meet Trevor Loudon, founder of the antisocialist website KeyWiki. Mainstream US conservatism can be so unhinged at times that it’s easy to forget its core tenets are also shared by others around the globe. Take one such figure, New Zealand’s Trevor Loudon, the red-baiting, right-wing conspiracy theorist behind the websites KeyWiki and New Zeal, and several documentaries about armies of secret communists hiding in cupboard drawers across America and has probably stalked you and your friends on Facebook. But Facebook posts and dank memes, it turns out, are only the beginnings of a dark conspiracy that stretches beyond conventional logic itself. If you’ve ever suspected that centrist Democrats are only kowtowing to their corporate overlords and torpedoing any minor attempt at left-wing reform as part of a long-term plan to establish one-party communist rule in the US, then Trevor Loudon has a story for you. It’s not exactly clear where his funding comes from — his blog, for example, asks readers to donate anywhere between $5 and $500 a month to keep his work going. But Loudon is in the unique position of having somehow convinced enough people to give him money to Facebook stalk strangers and pore over news reports involving left-wing activism, cobbling together information about even the most innocuous activists. If Loudon wasn’t clearly a true believer, the whole thing would be an excellent con. If you’ve attended left-wing protests, engaged in other types of left activism, or are a member of a left-wing organization like the Democratic Socialists of America, your name is probably somewhere on KeyWiki. Members of closed Facebook groups are Loudon’s specialty — the kind of juicy, secret detail only a crack gumshoe like him could dig up. The site features lists of members of groups like Democratic Socialists Swag Swap and Socialist Feminists (DSA), each name hyperlinked to a page about the individual. You may end up slightly disappointed, though: the site is more likely to detail the various embarrassing left-wing social media groups you belong to than any of the hard work you have invested in organizing. If you’re looking to read an actually interesting account of the life of a prominent activist, you would do better to skip KeyWiki and look at Loudon himself. It’s there you’ll find nearly five decades worth of entertainingly bizarre activities, associations, and statements, a collection of oddities that makes KeyWiki make a bit more sense. Even without this mangling of basic history, Loudon’s origin story is a little more complex. After growing up in a Labour-voting household, Loudon became politically active in the 1970s and 1980s through a Christchurch-based cult called Zenith Applied Philosophy (ZAP), best described as an unholy cross between Eastern mysticism, Scientology, and Ayn Rand’s Objectivism. ZAP was founded by John Dalhoff, a former Scientologist expelled for failing to live up to Scientology’s “ethical codes.” When a “church” that considers publicly defaming people one of its core religious tenets decides you’re too unethical to join, you know you’re in a whole other stratosphere. ZAP adherents hated unions, observed a jargon-filled, self-help-style philosophy about self-improvement, read proto-libertarian books like F. Bastiat’s The Law, preached in public, and stood on street corners asking people if they were “worried about creeping communism/socialism” while handing out reading material from the John Birch Society. Loudon began “studying” with ZAP in 1976 only two years after it began, making him close to a founding member. By the time he had founded ZAP, Dalhoff, who claimed he had reached the unclearly defined “ultimate state,” started referring to himself as “John Ultimate,” and declared he was “above nothing or below nothing. I am not god, and I have no wish to go down that state.” Dalhoff ran ZAP from his house, which he called the “center of the universe,” and received a steady stream of income from donations, ZAP businesses, percentages of ZAP members’ wages (or sometimes all of them), and penalties levied on members. Dalhoff reportedly earned more than $5 million this way and, like any self-respecting cult leader, bought up a fleet of expensive cars. There were also the Scientology-like courses, for which achievers, or “high-tone” people, were encouraged to pay hundreds and even thousands of dollars to move up. One member, who donated his entire salary to Dalhoff, died owing $25,000 to ZAP. Anyone who was kicked out but just couldn’t stay away could pay as much as $50,000 to be considered for readmission. The two dozen or so businesses run by ZAP were possibly worse — something like if Ayn Rand set up a chain of sandwich stores — regularly committing just about every labor violation under the sun. Many might have eventually balked at being part of something so clearly absurd and dishonest. Not Loudon, who was “enjoying [his] studies immensely” with ZAP as late as 2006, when he was vice president of the free-market ACT Party. The seeds for Loudon’s current work can be seen in his involvement with the Campaign for a Soviet-Free New Zealand, an organization cofounded by Loudon in 1986 that was dedicated to exposing supposed Soviet subversion in the country and ending trade with Moscow. The Campaign compiled dossiers on Labour government officials, including two future prime ministers, protested the sale of Lada cars, sent out pamphlets and leaflets warning about the communist threat in New Zealand, and accused various prominent figures of being on the payroll of the Soviet Union. In 1988, he launched the short-lived New Zeal, an eight-page magazine written by himself that served as the mouthpiece for the Campaign. Much of its short-lived run focused on the Soviet Union’s omnipresent subversion in the country, as well as fretting over an impending “race war” and “terrorist uprising” of indigenous Māori. New Zeal didn’t last long and neither would the Soviet Union, but Loudon apparently never got the memo. He later revived New Zeal as a blog, and through the 2000s, did everything from outlining in painstaking detail the backgrounds of university professors, actors, and politicians, to tracking and publicizing the activities of activists and other public figures. The New Zealand Green Party and its various personnel were a favorite target, and Loudon got some attention in the early 2000s when he started red-baiting the party, even though by then it was well on the way to substituting its radicalism for technocratic liberalism. Obama’s campaign and election in 2008 let Loudon spread his wings. The conservative panic over a supposedly radical Obama taking over the country afforded the perfect opportunity for Loudon, who never met an event he couldn’t tenuously tie back to Russia. What put Loudon on the map of hazy right-wing conspiracy was his role, in 2009, in “outing” then-green jobs “czar” and current CNN commentator Van Jones’s past as a revolutionary communist, which led to his resignation. He followed up this success by publishing two fantasy titles about communist infiltration of US institutions that appear to have been marketed as nonfiction. One, titled The Enemies Within: Communists, Socialists and Progressives in the U.S. Congress, “exposed” the way communists were exerting an influence on American society by infiltrating the US political system. Some of the vessels for this sinister left-wing subversion? Dull centrists like Barbara Boxer, Luis Gutierrez, and Nancy Pelosi. Loudon also began touring the US, informing local Republican and Tea Party groups that one hundred members of the House of Representatives and twenty senators were secret communists. He also alleged that the Clintonite Democratic party of the 1990s had started a communist purge that ended up expelling Joe Lieberman. “That sounded more like something in the 1950s,” said one confused Idaho Republican who listened to him speak. By 2015, Loudon was telling audiences that the Democrats/communists were planning to “dissolve the southern border,” “legalize all the illegals,” “turn Texas blue,” and establish one-party rule in the US. For this jabbering, Loudon’s star only rose among conservatives, culminating in his invitation to the 2017 CPAC, where he spoke at a panel moderated by none other than Supreme Court Justice Clarence Thomas’s wife Virginia Thomas. Most recently, other than KeyWiki, Loudon has occupied himself with making documentary films (“It was the communists who created the radical Islam,” argues one), teaming up with anti-Muslim hate groups to terrify older Trump voters, and reaching the extraordinary level of cognitive dissonance needed to reconcile his love for Trump with his hatred of Russia and Putin. True to form, Loudon found a way: he’s decided that Putin is actually funding “the top leaders of the anti-Trump protest movement,” while North Korea, Iran, and other bogeymen are to blame for the surge of anti-Trump protests. But perhaps the scariest prospect of all sits just over the horizon for Loudon: competition. According to a 2017 exposé by the Center for Media and Democracy, the conservative Bradley Foundation donated $115,000 to the Koch-funded Capital Research Center (which, incidentally, financed and produced one of Loudon’s films) in 2016 for the purpose of creating a “wiki-style encyclopedia of the Left.” (Apparently Loudon’s dossier of leftist Facebook activity isn’t cutting it for them.) If it ever gets off the ground, Loudon may well end up getting to experience one of the quintessential joys of capitalism: seeing his mom-and-pop operation muscled out by a bigger, better-funded competitor. In many ways, Loudon’s is the classic American tale: a man travels to the New World in search of opportunity and, cleansed of his past, remakes himself. In this case, Loudon’s opportunity was the deranged political climate that followed Obama’s election, and his past includes a history of fear-mongering and a multi-decade-long membership in a cult. Loudon’s page, obsessed as it is with the inconsequential minutia of obscure leftists’ online activity, probably isn’t that database. But if you’re looking for leads on the best left-wing meme stashes on Facebook, give KeyWiki a look.